way back before vintage may started, Em turned four! since her favorite thing is still the color pink (she’s obsessed with it, seriously), her party much resembles last year’s but with the added flair of elephants (her very favorite animal!). it’s a pink elephants on parade party! the art was painted by my talented friend Erin in Em’s nursery colors before she was born, inspired by one we saw at a local store. 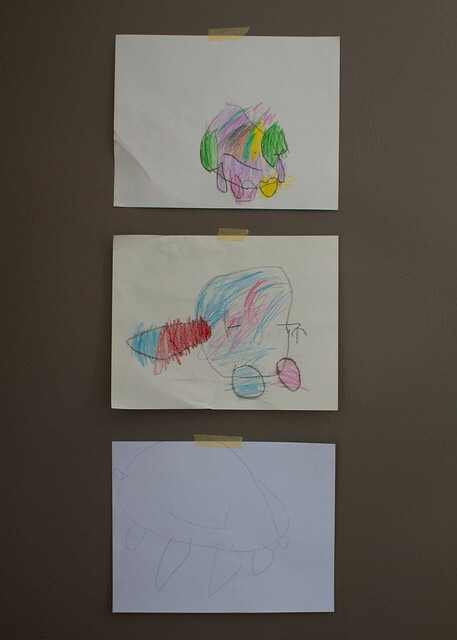 she moved bedrooms so it normally hangs in O’s room now, though she has requested it be moved to hers soon. the elephant statue is from west elm a while back. i made the elephant garland out of felt using the same method as the elsie marley eye patch tutorial, which worked great though it was pretty much the most tedious sew ever. i wanted to do it right rather than glue it or something so it could hang in her room later (which it now does). Em helped me color her cake to be…which colors? oh yeah, pink and purple! i don’t care if this is all over blogland, pretty much no one at the party had seen it. Em helped me with the sprinkles (i cut a 4 out of cardboard and she sprinkled…er…dumped them into the stencil). 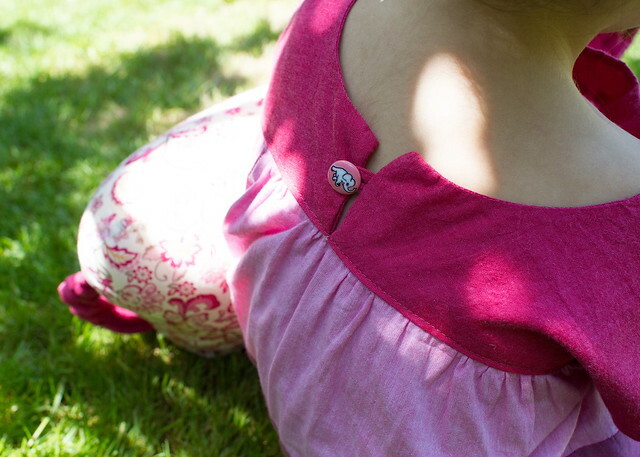 the birthday girl wore a new oliver + s ice cream dress, a pattern i first made for her second birthday. this one’s View B in a 3T and because she has a big head i cut the neck hole in a 4T, though i should have just followed this tutorial to lengthen the opening because it slips down off her shoulder a bit. i omitted the v to copy gail. Em didn’t like the morning dew on her feet. it’s in four colors of shot cotton from bolt, and i let her pick either a sparkly pink button or an elephant button…guess which one she chose? 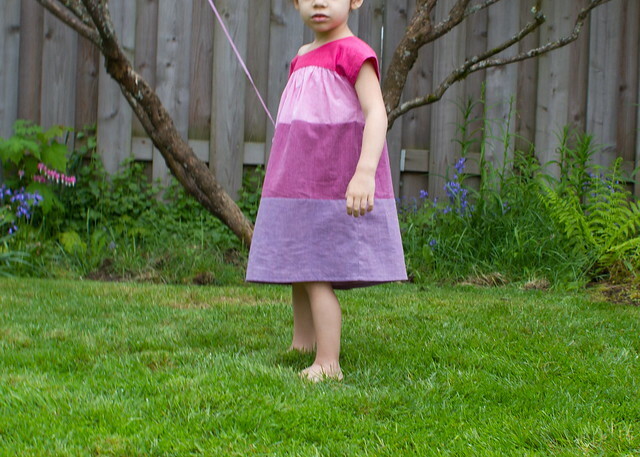 i had originally planned to make the dress ombre but couldn’t find four pink shot cottons that worked, so i moved the colors around and added the purple. then i saw this lovely ice cream dress and realized i should’ve just done the top in the light pink too! gah! her favorite gift was the sarah jane necklace we got her (you’ll never guess what’s on it). 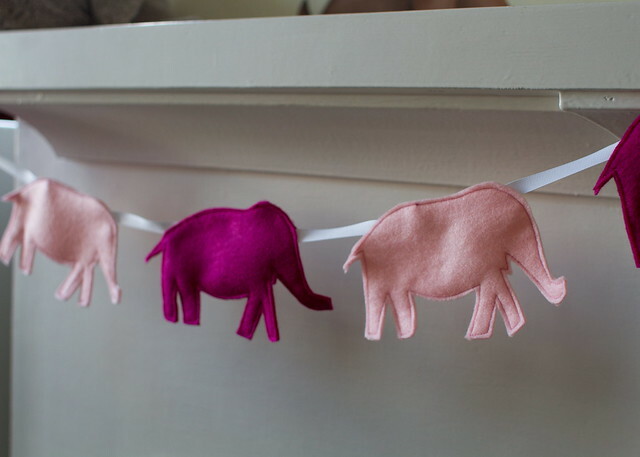 I adore those hanging pink elephants! And that dress – love it! I think I like it better with the dark pink top, rather then making it light and ombre all the way down. Yours gives it more of a kick! 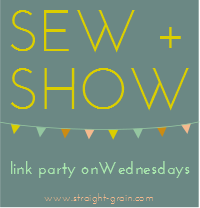 On another note – I had no idea Sarah Jane offered jewelery – gah – off to go check it out! What a lot of carefully thought out, beautiful details! The elephant garland is my favourite and wow what a labor of love. It looks pinka purpleicious!! I can imagine that elephant garland took some time but I’m with you take the time to make something that can last for years. Love the dress too! And yes, four is a hard pill to swallow isn’t it? I agree. Thanks so much! She goes to pre-K in the fall…I’ll be mentally preparing myself for that all summer I think! Happy belated birthday to your pink loving, elephant adoring 4 year old! My own daughter turned 4 a few months ago, and it does strike you suddenly by how “old” they’ve become! Love the ice cream dress . . . I hear that shot cotton is a dream to work with. Looks like it was a delightful party! Oh thank you and happy belated birthday to your 4 year old, too! Wow! Looks like a super fun party! I LOVE that elephant garland!! Looks like a wonderful party! Happy (belated) 4th Birthday, Em! that is the cutest party ever! 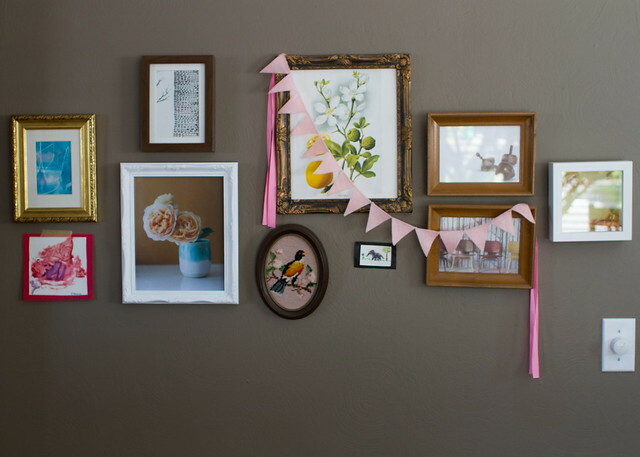 love the elephant garland. I can imagine it would be the most tedious sewing project ever! oh and the shot cotton dress is divine, I can just feel how soft and comfy it is. happy 4th to her! time flies! Beautifully done and that necklace is adorable! yay, i’ve been waiting for this post! 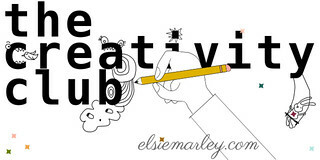 em must’ve been in heaven – you definitely captured all her favorite things in one place! 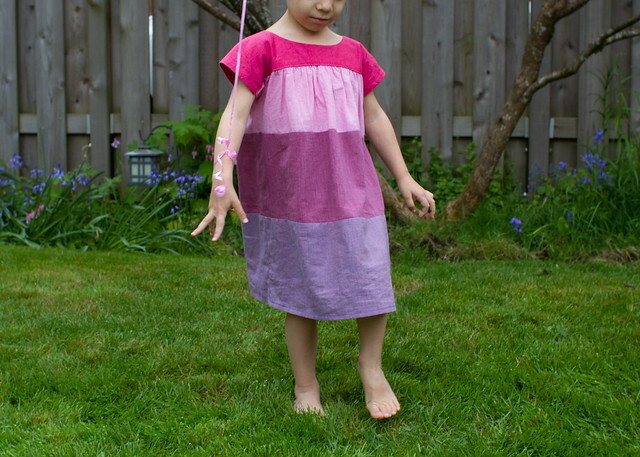 the dress came out great – lila actually asks to wear hers, which is quite a feat over here as you know – hooray for shot cotton and loose-fitting patterns. happy 4th birthday to em – such a big girl! aw thanks – she was TOTALLY in heaven. it was pretty cute to see her light up when she saw it. oh my! love it all & especially that dress! 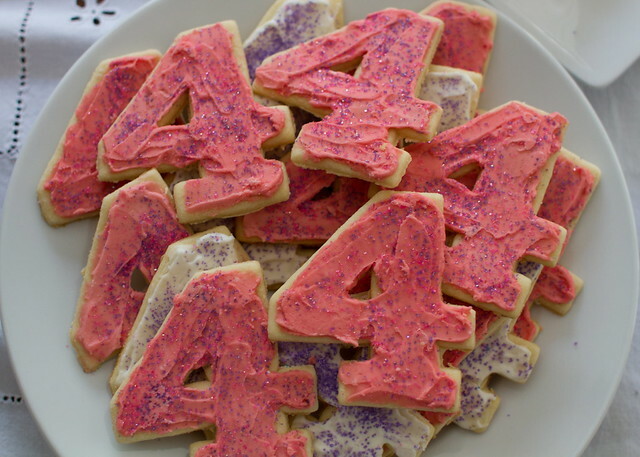 4 is a great age. 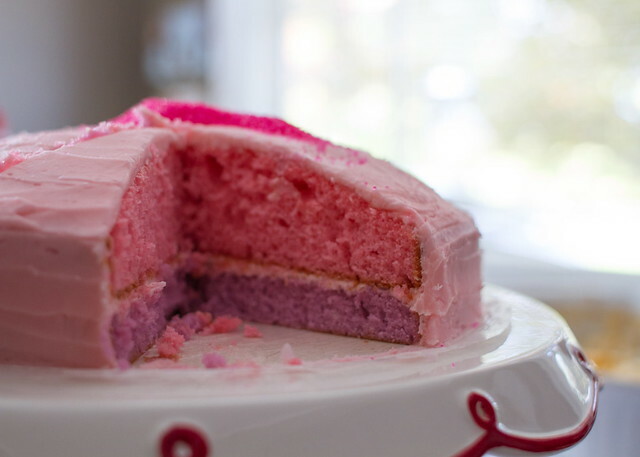 Love the pink and purple cake and the elephant garland. What a fun party. I love it!! Everything. The dress, the garland, the cake – it’s all so perfect. Maybe I’ll be consulting you in a few months when it’s party planning time for us. I see an ice cream dress in Yuki’s future . . .
What a perfect party and party dress. I’m definitely throwing my kids a breakfast bash next year! Ooh it all looks so lovely! You are such a great mom to do all that! Ive been meaning to make that dress. 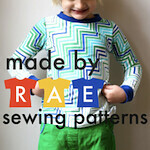 I bought the smaller pattern and Avery might have grown out of it already. 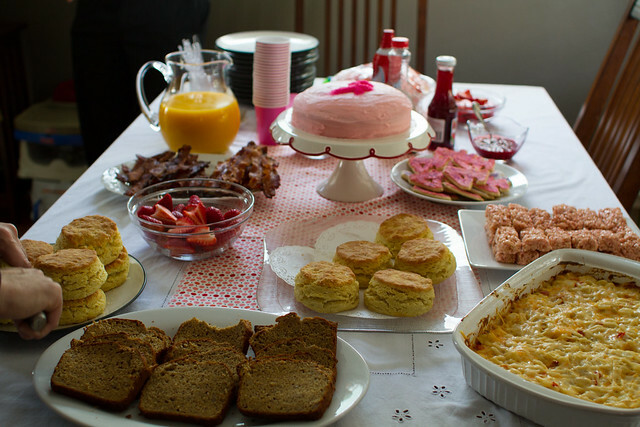 Anyway a breakfast party’s such a good idea! i bet she’d still fit it – it’s a pretty loose pattern. just add some length to the bottom, maybe? very cute! em always looks like she is having a blast, what a cutie! What a beautiful, sweet little party! Her dress is darling. That pattern is one I would really love to own someday. And the shot cottons look great! I love the colors together and the texture of the fabric looks comfortable to wear. I sure wish I could shop at Bolt! LOVE!! Kristin, this party is so, so cute and so Em!!! I think that pink elephants and little girls are just the cutest combination. Love that dress. 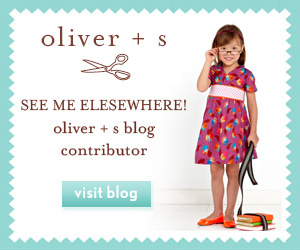 I think I’m going to have to invest in an oliver +s pattern or two – you make them look so lovely!! I love all the special touches with decorating. So pretty. aw thanks, stef! coming from the party planning queen, that means a lot! 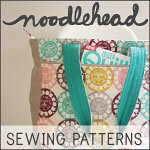 and yes, do try an O+S pattern – they’re so great! What a fantastic party! 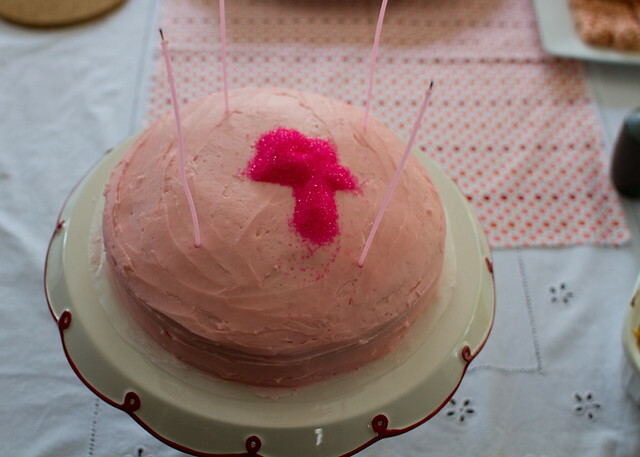 The cake, the dress, the decorations…you rock! And yum, all that food looks delicious! 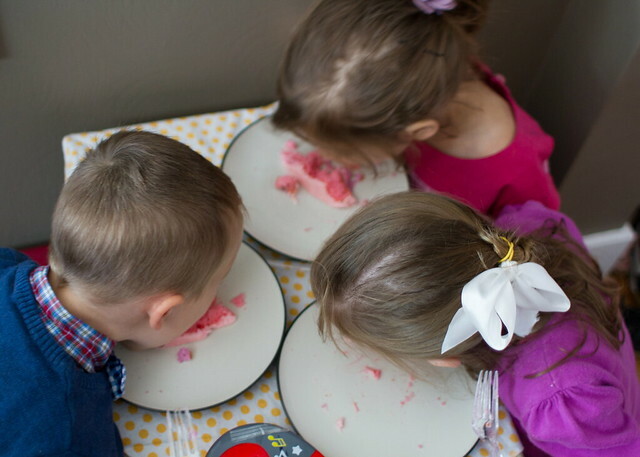 Love that photo of the kids eating the cake with their faces! Now THAT is a vote of confidence in your baking skills. Awesome. The decorations and the dress are perfect. What a pretty dress,who wouldn’t love it! love the pink!! we had a pink party for our little one’s third last year 🙂 the dress… amazing! 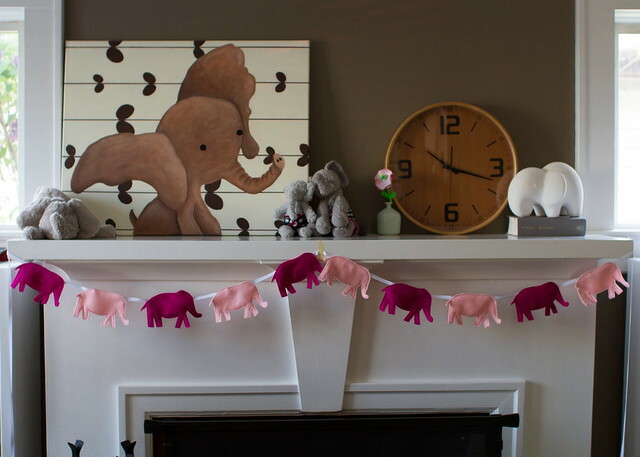 loooove the elephant garland!! Love everything. The dress is just soooo stinkin’ cute and so well made. 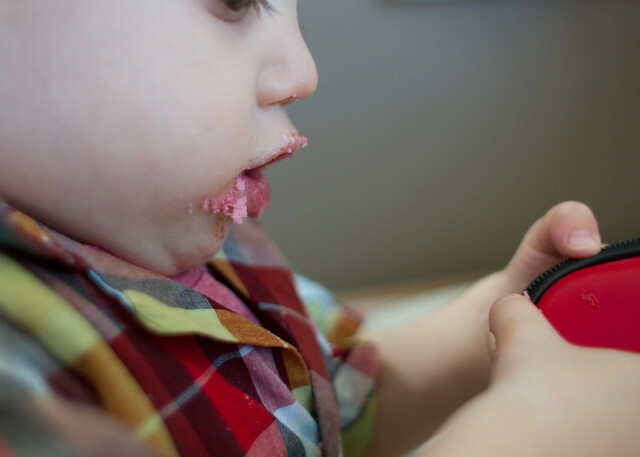 i might have to copy that cake (how did you make it??). and the garland too. Thanks for inspiring!!! !